The philosopher who inspired a generation of '60s radicals in the U.S. died in 1979; his ashes will be interred today. BERLIN - The grand boulevard of Friedrichstrasse runs through the center of this once-divided city, from West Berlin through Checkpoint Charlie and then into the former East Berlin. It ends at a 300-year-old cemetery. It is there, among some of Germany's intellectual giants, that the remains of a controversial philosopher of the 1960s student revolution will be given a final resting place today. For Herbert Marcuse, the German-born Marxist philosopher and a father of America's radical student movement, his last trip to Berlin will end with an official gesture of respect unlike anything he received in his lifetime. In America, where he had come to flee the Nazis, Marcuse's views and teachings made him a lightning rod for controversy. Then-Gov. Ronald Reagan once demanded his resignation from a teaching post at UC San Diego. The American Legion and the Christian Anti-Communist Crusade pressured the university to fire him. The Ku Klux Klan threatened to kill him. The Dorotheenstadtischer Cemetery is not a final resting place for ordinary Germans. The remains of such important intellectual figures as the philosophers G.W.F. Hegel and Johann Gottlieb Fichte are there. And near philosophers' row are the graves of dramatist Bertolt Brecht, his wife, actress Helene Weigel, and other artists. Today the remains of Marcuse, a former Santa Monica and La Jolla resident, will be interred in the cemetery - at the special invitation of the city of Berlin; his grave will be tended and maintained by the city. The ceremony will include the professor's family, as well as many of his students and followers, among them 1960s radical Angela Davis, who teaches at UC Santa Cruz. 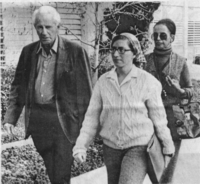 Herbert Marcuse was born in 1898 to a Jewish family in the wealthy Dahlem section of Berlin. He studied philosophy and was active in politics as a young man. Marcuse joined the legendary Institute for Social Research, the so-called Frankfurt School, which sought to combine cultural studies of Freud and Marx. The Nazi seizure of power left the Institute and Marcuse on the run, first to Geneva, then to Paris and later to the United States. Arriving in New York, he found a country amid a depression and flooded with German refugees. But he was offered a teaching position and so became a U.S. citizen. During World War II, Marcuse helped his new country, working as an analyst for the Office of Secret Services, where he prepared psychological profiles of Nazis. After the war, he helped prepare evidence for trials against German conglomerates involved in supporting the Nazis. He returned to academia in 1952, going first to Columbia University, then to Harvard and, in 1958, to Brandeis University. It was at Brandeis that Marcuse wrote his opus that inspired the student movement - "One Dimensional Man" - and had Davis and Abbie Hoffman as students. His critique of America, with its "comfortable, smooth, reasonable, democratic unfreedom" did not cause him trouble. Instead, it was a fight over free speech on campus and his opposition to the war in Vietnam that lead Brandeis not to renew Marcuse's contract. In 1965, the 67-year-old, white-haired professor accepted a long-standing offer from UCSD and moved to La Jolla. "He loved the California lifestyle and took his daily constitutional on the beach," recalled his grandson, Harold Marcuse. His class at UCSD, "Theories of Society," became one of the most popular on campus. He became widely revered by the student movements that embraced his critique of capitalist consumerism. "The people recognize themselves in their commodities; they find their soul in their automobile, hi-fi set, split-level home, kitchen equipment," he wrote. His message inspired legions of young radicals in Europe as well as in the United States. Daniel Cohn-Bendit, also known as "Danny the Red" and a leader of the May 1968 uprising in Paris, recalled: "Herbert Marcuse was particularly important in Germany, because the German student movement needed an intellectual leader who was not tainted by national socialism but who at the same time sought the emancipation from capitalism." Another fan of Marcuse (and a leader of the German student movement of the late 1960s) is Germany's foreign minister, Joschka Fischer. The popular Green Party leader spent his radical years in Frankfurt and was influenced by the Frankfurt School and in particular by Marcuse. "Joschka read a whole lot of Marcuse. He was very influenced by his critique of the Soviet Union," says Cohn-Bendit, a close friend of Fischer for more than 20 years. But while Marcuse was popular abroad during that period, at home in San Diego he became a target. Rather than accept FBI bodyguards after the KKK threat, Marcuse left in 1968 for the home of a friend in the Carmel Valley. Marcuse remained a professor emeritus at UCSD until 1979, when he died of a stroke while lecturing in Germany. His ashes were shipped to a funeral home in New Haven, Conn., where his son lived [actually Peter lives in Waterbury]. However, the ashes were never claimed, and undertaker Danny Klein said they were stored for most of the last 15 years in a former coat closet. That all changed in December 2001, when a student in Antwerp asked his philosophy professor where Marcuse was buried. The professor inquired via e-mail to the family, setting off a search and a debate over a final resting place. Marcuse's grandson Harold Marcuse, a history professor at UC Santa Barbara, suggested Berlin, arguing that there are more people in Germany today interested in his work. Granddaughter Irene Marcuse, a New York-based novelist, objected to having his ashes brought to Germany. "There are more than enough Jewish ashes mingled with German soil already, and I feel that it would be more appropriate for my grandfather's remains to be scattered in the country he chose as his own, in a place where he loved to walk, such as Torrey Pines near San Diego," she said. In the end, perhaps it was the offer by Berlin's city government to give his ashes a place of honor that persuaded the Marcuse family that the German capital was the right place. The ashes were transported to Berlin as carry-on luggage by his son, Peter, who packed the sealed cardboard box into a black backpack. "It seems symbolic that his ashes came from Germany to the United States for 25 years and are now going back. It reflects the various moves of his life and of our times," his son said.